the title of this post doesn't exactly trip off the tongue, nor does one's mind immediately latch on to the meaning. it wants to rearrange: fat duck fried chicken? fried duck chicken fat? 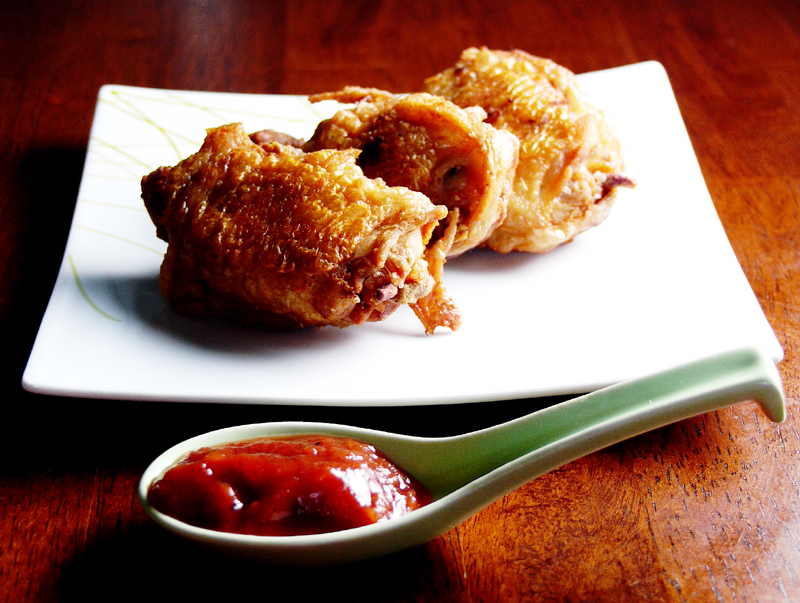 fried fat chicken duck? nay. i found a bunch of duck fat (yes, i believe that is the collective term) that was slated for something else, but somehow ended up in a cast iron pan, heated on a medium high flame until rippling. i don't know how much. maybe a pound and a half? inch and a half wet? ANYWAY, the chicken: small plump thighs, organic ok, wash, patted dry, seasoned with a bit of kosher salt and white pepper, that's it. 10 to 15 minutes on each side in an uncrowded pan, don't fuss, don't poke. read a magazine article, the newspaper, or tweet. drain on paper towel. serve. a schmantzy condiment, a grilled tomato ketchup. you could pour a bottle of ketchup onto a grill but that would be messy. tomato halves and onions went in a grill pan with a smidge of olive oil, until a nice bit of char was achieved. they then went into this epicurious recipe, replacing the canned ones on the ingredient list. doubled the amount of tomato paste instructed for good measure, too. worked a charm. and the chicken? 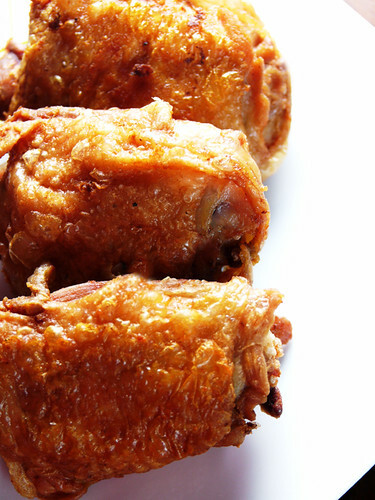 crispy, shardy skin, juicy meat that seems saturated in duck fat. i called this a work in progress because although this was decadent and delicious and oh-so-delightful, i might try marinating the meat next time, or perhaps use an herby confit fat. can't see how it can hurt. 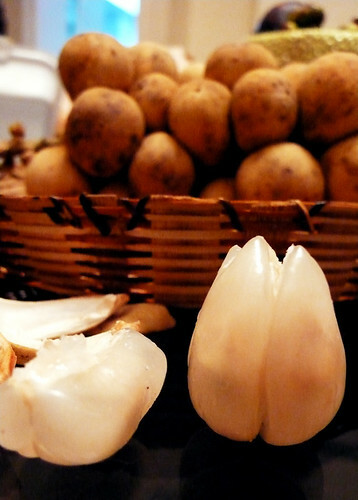 one of my family's most favourite fruits is lanzones, or Lansium domesticum, from the family Meliaceae. 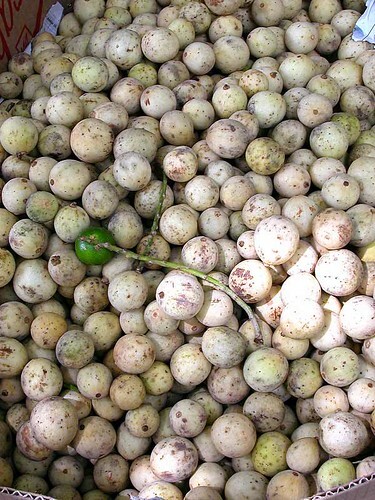 this tropical fruit is thought to have originated from malaysian peninsula, and is found in great abundance in the southern provinces of the philippines, including sulu and camiguin; it is also found in the laguna province of luzon. camiguin is known for having particularly sweet and desirable fruit, and has a festival in the fruit's honour in early october. however, now is the (short) season for laguna's bounty. this ovoid-to-round fruit is about the size of the a large concord grape, the skin is yellowy beige, which covers the opaque, segmented flesh that is mostly seedless; there can be, however, one large seed, bitter with tannins, hidden in one of the segments. the flesh itself is sweet and juicy, with a texture similar to lychees and a flavour similar, but without the florally finish. the fruit grow in grape-like bunches off of tall and lanky trees, which give off a sticky resin when the fruit is picked; the resin is thought to protect the stomach from alcohol, but is bitter and difficult to actually imbibe. the bark of the tree contains anti-inflammatory properties and thought to be an anti-spasmodic--traditional medicines made from it are used against everything from dysentery to scorpion bites. which, i don't know, could be handy where you live.